Prisons Face Population Drop in The U.S. The U.S. has long had the unenviable distinction of holding the world's largest prison population, in part because of tough-on-crime policies enacted in the 1990s. The U.S. has long had the unenviable distinction of holding the world’s largest prison population, in part because of tough-on-crime policies enacted in the 1990s. But sentencing reforms passed in recent years appear to have made a dent, leading to declines in the population over the past eight years. A criminal justice reform organization reported Friday that in 2017, the U.S. prison population dropped below 1.5 million for the first time in more than a decade. The decline, according to the Washington-based Vera Institute for Justice, was driven by a sharp decrease in the number of inmates in federal prisons and decreases in several states with large prison populations. The decline extended an eight-year downward trend in U.S. prison population that has been driven by federal and state sentencing reforms enacted over the past decade. But the Vera institute cautioned that it was unclear whether the trend would continue. The report came as President Donald Trump called on Congress to pass legislation to help former inmates reintegrate into society and avoid going back to prison, as many do. “Nobody wins when former prisoners fail to adjust to life outside, or worse, end up back behind bars,” Trump said. 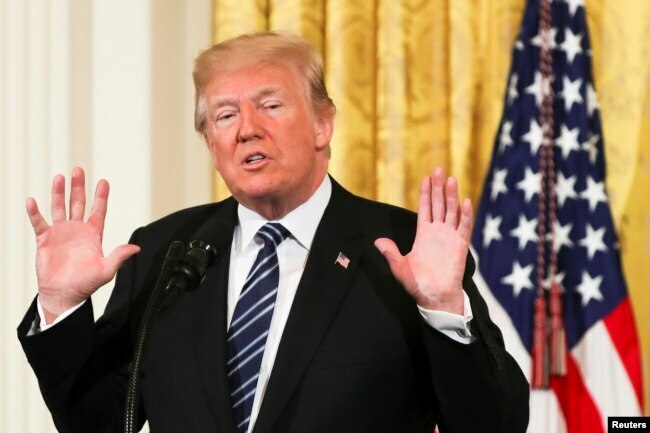 U.S. President Donald Trump gestures as he delivers remarks during the Prison Reform Summit at the White House in Washington, U.S., May 18, 2018. White House officials said Trump supports legislation that promotes “evidence-based risk and needs assessments” of prisoners and expands prison work programs, among other initiatives. They did not specify the legislation. The House of Representatives is expected to vote next week on legislation that hews closely to the White House’s prison reform agenda. The First Step Act, recently passed by the House Judiciary Committee, calls for “risk and needs assessment” of prisoners and expands recidivism-reduction programs for prisoners.